"About Levi he said; 'Your Thummim and Urim belong to the man you favored. You tested him at Massah; you contended with him at the waters of Meribath. He said of his father and mother, 'I have no regard for them.' He did not recognize his brothers or acknowledge his own children, but he watched over your word and guarded your covenant. He teaches your precepts to Jacob and your law to Israel. He offers incense before you and whole burnt offerings on your altar. Bless all his skills, O Lord, and be pleased with the work of his hands. Smite the loins of those who rise up against him; strike his foes till they rise no more." The tribe of Levi was unique to the other tribes of Israel in that they received no allotment from the Lord. Numbers 3 describes, in detail, God's commandments concerning Levi to Moses. His reason for not allotting them any land is given in verse 11. "The Lord also said to Moses, 'I have taken the Levites from among the Israelites in place of the first male offspring of every Israelite woman. The Levites are mine, for all the firstborn are mine. When I struck down all the firstborn in Egypt, I set apart for myself every firstborn in Israel, whether man or animal. They are to be mine. I am the Lord." God reiterates His orders to Moses in verses 40 and 41 as well. "The Lord said to Moses, 'Count all the firstborn Israelite males who are a month old or more and make a list of their names. Take the Levites for me in place of all the firstborn of the Israelites, and the livestock of the Levites in place of all the firstborn of the livestock of the Israelites. I am the Lord." In both passages, God ends by re-stating to Moses He is the Lord, and His orders stand without question. Throughout the Old Testament, God requires blood sacrifices as a propitiation for the sins of the Israelites. In the case of Pharaoh and his hardened heart, God struck down all firstborn males in Egypt. Pharaoh's stubborness and refusal to let the Israelites go forced God to show Pharaoh His strength and power. The tribe of Levi became the sacrifice of thanks for God's deliverance. In exchange for the firstborn males and livestock, God took the Levites as a sacrifice for Him, and dedicated this tribe to His service. The reason for the tribe of Levi being chosen by God will be discussed below. Thus, the Levites and their clans were excluded from a land allotment because their service would require them to live throughout all of Canaan. They were to minister the Lord's instruction and required sacrifices for all of the 12 tribes of Israel. If God were to allot territory to the tribe of Levi, they would be limited in their scope of influence. In order to alleviate this, God assigned the Levites cities they were to dwell in. These cities were scattered all over the land of Canaan encompassing every tribe and every region. Just as the land allotment to the other tribes were distributed by clans, so were the cities of the Levites distributed by their clans. In order to understand this, it is necessary to understand who constituted the tribe of Levi at this time in ancient Israel . The opening verses of Exodus 2 describe a birth which would change the world forever. "Now a man of the house of Levi married a Levite woman, and she became pregnant and gave birth to a son..."
And so begins the story of the life of Moses. Moses was born to Amram, a Levite. Amram was the son of Kohath. Kohath, in turn, was a son of Levi, the third son of Jacob. Moses' mother was also a Levite, thus Moses was of pure Levitical blood. Moses was given a brother later, Aaron. Together, these two would become the first priests overseeing the well-being of the tribes of Israel as a whole. The tribe of Levi began to emerge as a leading tribe in the time of Moses and Aaron. It would be based on this family tree which God would distribute the Levitical cities. The sons of Aaron were to become the "anointed priests". Their dwelling would be the Temple, or, in the wilderness, the Tent of Meeting. The remainder of the Levites were to serve Aaron and his sons by doing "the work of the tabernacle". The cities, thus, were divided based on the sons of Levi, not Aaron. The sons of Levi were Gershon, Kohath, and Merari. These were to become the clans of the Levites. The cities were to be distributed according to these clans, based on the sons of Levi. Scripture gives a detailed list of the clans within the tribe of Levi in Numbers 3:21-33. To Gershon belonged the clans of the Libnites and and Shimeites. The males one month old or older totaled 7,500. To Kohath belonged the clans of the Amramites (Amram was the father of Moses), Izharites, Hebronites and Uzzielites. They totaled 8,600. To Merari belonged the clans of the Mahlites and Mushites. They totaled 6,200 males one month or older. Each clan of the tribe of Levi was given a list of cities that can be found in Joshua 21. The Kohathites were allotted twenty-three towns from the tribes of Judah, Simeon , Benjamin, Ephraim, Dan, and the half tribe of Manasseh. Their city allotment is listed in Joshu 21:9-25. The Gershonite clans were given thirteen towns from the tribes of Manasseh, Issachar, Asher and Naphtali. Their city allotment can be found in Joshua 21:27-33. 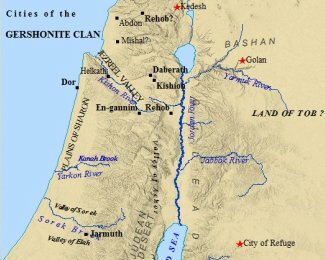 GERSHONITE CLANS OCCUPIED CITIES IN THE NORTH OF ISRAEL - IN THE JEZREEL VALLEY & GALILEE. GERSHON WAS 1 OF 3 CHILDREN BIRTHED TO LEVI. Only 9 rested south of Jerusalem. The heartland of Israel, Judah, Ephraim, and Manasseh, did not receive the majority of Levitical cities. Rather, most cities lie in the peripheral areas to the north and east of the heartland. Much of the area encompassed by these cities of the tribe of Levi lie within Canaanite controlled territory until the time of David. Indeed, God's presence was needed most in these areas under idolatrous influence. Numbers 35 records an interesting conversation between God and Moses. God instructs Moses on how each city given to the tribe of Levi is to be structured. God's attention to detail is incredible. The pasture lands around each town are to extend fifteen hundred feet from the town wall. Three thousand feet are allotted for each pastureland, on each side of the city: 3,000 ft. on the east side; 3,000 ft. on the south side; 3,000 ft. on the west side; and 3,000 ft. on the north side. Each of the tribes of Israel, in essence, paid a tithe to God; in the form of towns and land, within their respective tribal allotment. These were to be given specifically to the tribe of Levi. Published in 1847 by John Wright Printer, The History of the Tribe of Levi Considered is an in-depth study in into the tribe of Levi. Click on the link below to re-direct to Amazon.com. Six cities of the tribe of Levi were designated as cities of refuge by God in Numbers 35. These were to be cities which an individual guilty of accidental murder could flee and await trial. Once inside the walls of the city of refuge, the accused was free from blood vengeance sought by any relative of the victim. He would remain in the city until a trial, at which point he would stand "trial before the assembly". If found innocent of premeditated murder, he would be free to live in that city of refuge until the death of the High Priest. The individual in question was free from death by an embittered relative within the walls of that city. God made it clear, however, that if caught outside the walls of the city, he was no longer protected by the city of refuge. In such cases, the individual in question would be vulnerable to blood vengeance, with no guilt being assigned to the blood avenger. Upon the death of the High Priest, he or she was allowed to return to their previous home and way of life, free from guilt, and having served their sacrificial time for bloodshed, even accidental. This was an important point the Lord made to Moses. God did not wish war and bloodshed upon the land. He wished for peace, and prosperity. This is made plain by God in Numbers 35:33-34. 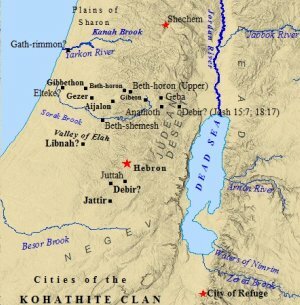 The six cities of refuge were in strategic locations on both sides of the Jordan River. 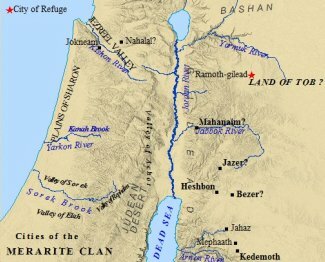 Three cities were east of the Jordan River, in the Transjordan; Golan, Ramoth-gilead, and Bezer. 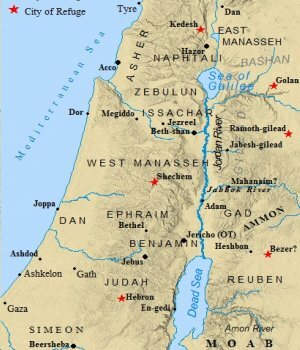 Three cities were west of the Jordan, in Canaan proper. 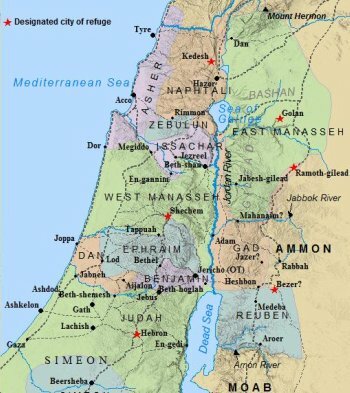 These cities were, from north to south; Kedesh, Shechem, and Hebron. The encampment of the Israelites in the wilderness was rigidly defined and structured by God. They were a highly organized unit, composed of distinct and individual parts. At the center of this unit was the tribe of Levi. 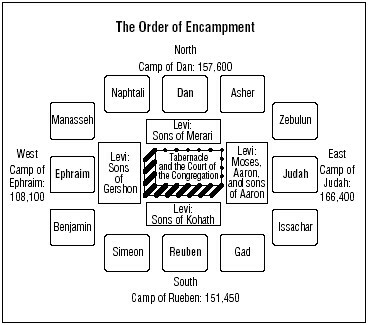 The Levites were given orders as to how their camp was to be organized as well.At the center of the Israelite camp was the Tent of Meeting. This area lay enclosed within a fence of curtains specified in Exodus 38. The actual Tent of Meeting, with the ark of the covenant, lie in the center of this courtyard. The Levites encamped around the Tent of Meeting, in the surrounding courtyard. The English word "tabernacle" derives from the Latin, tabernaculum. This translates as "tent." During the Exodus this was the portable sanctuary, or House of God. Exodus 25:8 gives God's commandment to Moses to build Him a sanctuary. "Then have them make a sanctuary for me, and I will dwell among them. Make this tabernacle and all its furnishings exactly like the pattern I will show you." Within the Tent of Meeting, or the tabernacle, were two separated areas. The first area one would encounter was the Holy Place. Sacred furnishings were in the Holy Place; a seven-branched oil lamp stand, a table for 12 loaves of show bread, and an altar for incense burning. A curtain of blue, purple and scarlet yarn, with a picture of a cherubim "worked into it" separated the Holy Place from the Most Holy Place. The ark of the Covenant rested in the Most Holy Place. This place would come to be known as the Holy of Holies in the Temple. Surrounding this tent was the courtyard, where the tribe of Levi would encamp around the tabernacle. 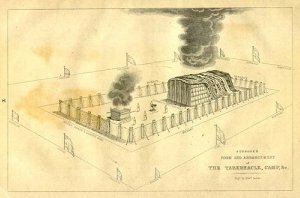 They were given specific places to pitch their tents by Moses, as well as specific duties regarding the tabernacle. The Gershonite clan was to encamp on the west, behind the tabernacle. They were responsible for the care of the tabernacle and the tent, which included mostly curtain detail. The Kohathite clan was to encamp on the south side of the tabernacle. They were responsible for the care of the sanctuary. This included the specific articles, instruments, and furnishing of the sanctuary. The Merarite clan was to encamp on the north side of the tabernacle. They were responsible for the equipment needed to set up the tabernacle; including posts, bases, poles, tent pegs, etc. Moses, Aaron, and Aaron's sons were to encamp on the east side of the tabernacle, "toward the sunrise, in front of the Tent of Meeting". They were responsible for the care of the sanctuary on behalf of all of Israel. Scripture is clear that anyone else approaching the sanctuary was to be put to death. The rest of the 12 tribes of Israel encamped around the Tent of Meeting and the tribe of Levi. The Levites, thus, were at the center of the Israelite camp. Within the center of the Levite camp, rested the Tent of Meeting. In the center of the Tent of Meeting, dwelt the Ark of the Covenant, and God. Levi was the third son of Jacob , born of Leah. His birth is recorded in Genesis 29:34. "Again she conceived, and when she gave birth to a son she said, 'Now at last my husband will become attached to me, because I have borne him three sons.' So he was named Levi." Levi translates as "joined". In the sense Leah felt joined to Jacob now, so the tribe of Levi would become joined to God, set aside as His tribe. Levi was mentioned briefly in the narrative concerning the 12 sons of Jacob. He is most known for his joint attack of Shechem with his brother Simeon. Scripture makes mention of one daughter of Jacob. Her name is Dinah, and she plays a brief, but prominent, role in the Bible. Scripture indicates she was out among the girls of Canaan one day, when she is raped by Shechem, the prince of the area. Hamor, the father of Shechem, approached Jacob with the hopes of obtaining Dinah's hand in marriage, seemingly unrepentant for his son's actions. Jacob was greatly distressed, and said nothing until his sons returned from the fields. Upon hearing of the news, Jacob's sons hurry back to their father, obviously in a state of distress and anger. Interestingly, throughout the narrative Scripture indicates it was "the sons of Jacob" dealing with Hamor and Shechem. Jacob is silent throughout, and no particular brother is singled out as leader. Scripture says "Jacob's sons" conspired together, and deceived Shechem and his father.Together the brothers convinced Shechem to circumcise all the men of the city of Shechem. Only then would they give Dinah to him in marriage. All the men of Shechem readily agreed to this, and the city was circumcised. It is at this point the story takes a sharp turn. 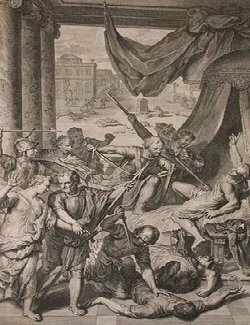 Scripture gives no details, other than Levi and Simeon, in verse 25, "attacked the unsuspecting city". These are the only two of Jacob's sons mentioned by name in this story. The specifics of their actions are not given, only a brief description in verse 25 and 26. These two brothers would would have naturally been close, being the second and third born sons of Jacob, both from Leah. Dinah, as well, was born of Leah, thus was a biological sister to the two. Scripture, however, is silent as to the planning and execution of the slaughter. Jacob became very distressed about the situation, despite his conspicuous absence, and berated Simeon and Levi. God instructed him to move the family south, to Bethel. These actions would prove to be the motivation behind Jacob's Blessing to Levi in Genesis 49. Though not mentioned by name in the plot to kill Joseph, that alone is indication Levi readily went along with the plan of the other brothers. His silence may also imply he was of the original mindset to murder Joseph. It was Reuben who swayed their minds from murder. Thus, Levi was guilty as well of the wrong done to his own flesh and blood. The remainder of the references concerning Levi in the Bible primarily focus on his sons. Genesis 46:11 records Levi went into Egypt with his three sons; Gershon, Kohath, and Merari. Scripture also records the wives of the sons of Jacob migrated with their husbands, though they were not counted in the seventy listed in Genesis. Exodus 2:6 records Joseph and his brothers, "and all that generation", died in Egypt. The Israelites, though, multiplied exceedingly. It would be during the Exodus the tribe of Levi would rise to prominence. The tribe of Levi would rectify the wrongs of their namesake in the wilderness. Their faithfulness to God would draw His approval, and later His blessings upon them. The tribe of Levi can be traced through the father of Moses, Amram. Amram was the son of Kohath. Kohath was the son of Levi. Thus, Moses and Aaron were direct descendants of Levi, the son of Jacob. Amram married a Levite woman as well. The two had three children, Moses, Aaron, and a daughter named, Miriam. Levi, however, had long ago died by the time of Moses and Aaron. Exodus 6 records Levi died at 137 years of age, and after fathering three sons; Gershon, Kohath, and Merari. Kohath, the father of Amram, lived only to be 133 years old. Amram would live to be 137 years old. Moses would eventually die on Mt. Nebo at 120 years of age, though "his eyes were not weak, nor his strength gone". The emergence of the tribe of Levi would occur soon after Israel's flight from Egypt, in the desert of Sinai. The incident can be found in Exodus 32. This particular chapter is known in many translations of the Bible as The Golden Calf. Soon after their flight from Egypt, God called Moses to meet Him on top of a mountain. Moses ascended to the top of Mt. Sinai, in obedience to God, and received many instructions from God, including the Ten Commandments. Scripture records the Israelites down below grew anxious. They gathered around Aaron, the brother of Moses, and questioned him as to why Moses would take so long on the mountain. They became fearful, and urged Aaron to make gods for them. Aaron gave in, with little resistance, and made a calf, covered likely by a thin sheet of gold, hammered from the gold Scripture records the Israelites offered him. This thin sheet of gold probably resembled a golden foil, similar perhaps to modern day aluminum foil. Scripture indicates the Israelites "sat down to eat and drink and got up to indulge in revelry". This may well have included sexual immorality on a large scale. Scripture seems to imply all the tribes of Israel were participating in this debauchery. The narrative soon makes it evident this was not the case, as one tribe remained faithful. Meanwhile, on top of the mountain, God warns Moses of the idolatrous festivities below. Moses, with Joshua, descended the mountain to the camp below. Scripture records the scene in Exodus 32:25. The camp was in complete chaos, it would seem. The demonstration was one of gross immorality and idolatry. Moses was furious with the Israelites. In fact, Scripture records his "anger burned and he threw the tablets out of his hands, breaking them to pieces at the foot of the mountain." Moses was so angry, in his anger he threw the sacred words of God he had just received to the ground. It is interesting to note God does not condemn Moses for his anger. Rather, He had a much more severe judgment in store for the wayward and "stiff-necked people". It is worthy to note Moses interceded on behalf of the Israelites, and swayed God from wiping out all of them, save Moses (32:9-14). Yet Moses' compassion did not sway his anger towards his brethren. The Bible says Moses stood at the entrance of the camp, and offered the Israelites one chance to turn from their ways. "Whoever is for the Lord, come to me." "And all the Levites rallied to him." One can presumptuously see God's face as His anger burned against His people. Their lack of faith was infuriating. Yet, amongst His anger, He must have raised an eyebrow in delight as a tiny band of people emerged from the mass of immorality, and rallied around Moses. God, indeed, took notice of the faithfulness displayed by the tribe of Levi. He realized this was a tribe He could use. These people had proven their faithfulness to Him, against the pressure from the remaining tribes of Israel. The tribe of Levi is the only tribe Scripture mentioned rallied to the call of Moses. Moses then ordered the tribe of Levi to "strap his sword to his side". Moses' next order was for each man to go forth through the camp, from one end to the other, "each killing his brother and friend and neighbor". Though the Israelites were the chosen nation of God, it was because of the faithfulness of individuals. This incident shows God sought obedience, regardless of race and ethnicity. To fail to fulfill His commandments ushers forth His judgment. In this instance, Moses and the men of the tribe of Levi killed three thousand of their own brethren that day. The tribe of Levi would be blessed by God because of this incident. This is reflected in the number of Levites counted in the two census' taken by Moses. Over the course of the desert wanderings, the tribe of Levi increased its number by 1,000 males one month of age or older. Compare this statistic with the fact the tribe of Simeon lost two-thirds of their men over the same amount of time. 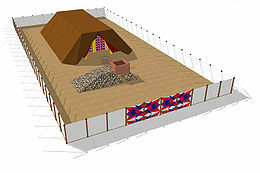 The tribe of Levi became the tribe responsible for the care and maintenance of the tabernacle. However, they were distinct from the priests, as Aaron and his sons were designated priests. When the tribe of Levi is mentioned in relation to their duties, they are referred to as the Levites.Their special uniqueness led God to bless them through the many cities and pasture lands they received, mentioned above. They were the temple workers, servants, overseers. They would become the leaders of ceremonial rituals in the Temple. The word of God would be transmitted through the Levites to His people. Their role in the history of Israel was, perhaps, the most vital role of all. In time, the Levites would find special favor with King David. Scripture records 3,700 men from the tribe of Levi offered their services to David in I Chronicles 12:26. David would later return the favor in I Chronicles 23. David was "old and full of years", and began to take stock of his kingdom. His son, though not his oldest son, Solomon was to become king following his death. David gathered together all the men of Israel, including the priest and Levites. He then re-instituted the duties Moses had assigned to the priest and Levites centuries earlier. Scripture records David divided the Levites into groups corresponding to the sons of Levi, just as Moses had done. David assigned the Levites to supervise the work of the Temple, be officials and judges, be gatekeepers, and "four thousand are to praise the Lord with musical instruments I have provided for that purpose." Over the course of time, kings of Israel would fall into idolatry, and abandon the ways of God. However, God would raise up a king who would establish righteousness once again in Israel. Each revival centered around the re-establishment of the tribe of Levi, and the priestly duties of the Levites. Such was the case in the instance of king Jehoshaphat. Michael Grant, in his book The History of Ancient Israel, indicates Jehoshaphat included priests and Levites among the members of a national judicial commission. This was one of many reforms, including a spiritual reform, instituted by Jehoshaphat. The significance is that centuries after Moses, the tribe of Levi was still an integral part of Israelite life. Many scholars feel the prophet Hosea may well have possessed a priestly, Levitical background. The great prophet Jeremiah may have been a Levite and priest as well. The scribe and prophet Ezra was a Levite, from the line of Aaron. His lineage is given in the opening verses of Ezra 7. Ezra was descended from the line of Eleazar, a priest during the Exodus, and a son of Aaron, >"the chief priest". Ezra led a group of "priests, Levites, singers, gatekeepers and Temple servants" back to Jerusalem, under the reign of Artaxerxes, king of Persia. Ezra was sent under the orders "to inquire about Judah and Jerusalem with regard to the Law of your God"
The tribe of Levi appears again and again in the crucial stages of ancient Israel's development. The remarkable discovery of the Dead Sea Scrolls in the 1940's shed an invaluable light on what the ancients were reading and studying in regards to the words of God. Though many wonderful translations exist, one such is The Complete Dead Sea Scrolls in English. Geza Vermes provides an excellent and authentic translation, with valuable insight. He is recognized as a leader in the study and research of the Dead Sea Scrolls, as well as a number of other subject. Throughout many of the texts discovered at Qumran, the tribe of Levi and the Levites play a prominent role in many of them. One such document, entitled The community Rule, discusses the organization and structure of daily life within a monastic kind of society. The people this document referred to were known as "ascetics". The tribe of Levi is mentioned throughout the document. Vermes points out these people structured much of their Jewish monastic community like their Israelite predecessors. The priesthood at Qumran mirrored that of the Exodus; the priest was superior to the Levite, the Levite superior to the Israelite, and the Israelite superior from the non-Israelite. 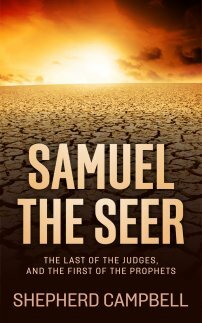 The Community Rule speaks of ten judges drawn from the tribes of Levi, Aaron, and Israel. These judges are to sit in judgment over disputes within their territory, often towns. They were to be between the ages of 25 and 60. These men were to preside over the "assembly of the camp", and on larger scale, "assembly of all the camps". The Levites are represented as being the fundamental blocks of worship in both the monastic and urban settings. Another document designated "The Temple Scroll" depicts the Levites receiving tithes from Israel of corn, the wine, and the oil. The tribe of Levi stands out amongst the other tribes in another document entitled The War Scroll. Vermes believes this document drew its primary inspiration from the ancient book of Daniel. The contents of this scroll deal with Messianic rule, and the battle between good and evil. The "sons of Light" are to battle "the company of Darkness". The sons of Levi, Judah, and Benjamin are said to have come out of exile, from the "Desert of the Peoples" and encamped in the "Desert of Jerusalem". The War Scroll indicates the priests and Levites will direct the war, and guide the movements of the troops. The tribe of Levi is specifically assigned the task of carrying rams' horns. They perform ceremonial rituals, preparing the troops for battle, and following the lead of the priests. The Levites are to blow the rams' horns, and sound " a mighty alarm to terrify the heart of the enemy". At the moment of triumph, the Levites shall stand with the priests before the people and call on the name of the Lord. Thus, the tribe of Levi is depicted in the future, final, Mesaianic battle, remaining steadfast against "the company of Darkness". Another remarkable scroll was discovered at Qumran, "The Testament of Levi". Numerous small fragments were discovered written in Aramaic. These fragments dated back to the middle of the first century B.C. An incomplete manuscript of a prayer attributed to Levi was discovered. Using a copy of the same text, dated much later in the eleventh century A.D., it was possible to complete the missing sections of this prayer. In this text, Levi accepts the priesthood in a vision he receives. In this vision he is blessed by Jacob and Isaac . Jacob clothed him in a priestly garment, "and I became a priest of the everlasting God". Another document, entitled "Testament of the Patriarchs", focuses primarily on Levi. Vermes states the text is probably a testament of Jacob, about Levi. In this document Levi is said to have atoned for "all the sons of his generation". This ancient document was written in Aramaic as well, and dates to the end of the second century B.C. This document speaks of a future priestly figure, encountering resistance and persecution from the men of his generation. One document underwent a carbon 14 test in 1990. The result was this text was dated much earlier than previously thought. The original dating of "The Testament of Qahat" was the end of the second century. However, the results of the Carbon 14 test placed this fragment from possibly as early as 383-353 B.C. This document is a direct contribution from the tribe of Levi. Qahat was a son of Levi. In this text he is talking to his son, and stressing the importance of their heritage. "Now, my sons, be careful with the heritage which is handed over to you..."
Qahat became a major figure within the tribe of Levi. He preached to his sons the need to "hold to the word of Jacob, and seize the laws of Abraham and the righteousness of Levi". Qahat's message was heeded by his son Amram. Amram was to father a son that would take on the name Moses. The impact of the tribe of Levi cannot be denied. Their faithfulness in the desert was rewarded many times over by God, further proof of His faithfulness. Over the course of centuries the tribe of Levi would play instrumental roles, at pivotal moments, in Israelite history. The tribe of Levi produced Moses, Aaron, Ezra, perhaps Hosea and Jeremiah, and countless others of key figures throughout the Old Testament. This tribe would shape the history of Israel in a profound and meaningful way. Consequently, they are prevalent in many ancient sources outside of the old Testament, such as those of the Dead Sea Scrolls. The tribe of Levi is to take their place among the 12 tribes in the New Jerusalem , according to Revelation 7:5-8. Revelation mentions in the Messianic Kingdom no Temple will be present, for God will dwell among His people. With this in mind, one wonders what the role of the tribe of Levi will be in the future Messianic Kingdom?